Tomakeandtobe is Kenneth Kortemeier, woodworker and teacher. 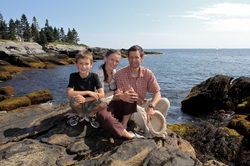 My family and I live in midcoast Maine, where we have been designing and building our off-the-grid home since 2007, among other things. I am interested in self-sustainability, wood work, metal work, artwork, any kind of Essential Human Work; work which connects us to ourselves, our environment, our fellows. but since 2013 I've been piecing it together doing restoration carpentry, furniture making and teaching woodworking. This past summer I taught chair making as well as bowl and spoon carving at Country Workshops in Marshall, NC. been wanting to do for many years now. Check out the brand new website - the Maine Coast Craft School and come visit us! For more details about my interests and skills see the "about" page here, the blog, and some photos on Instagram at kkortemeier. beautiful documentary film, Etre et avior (To Be and to Have) about a one room school house in France.